Gerry Dawes's Spain: An Insider's Guide to Spanish Food, Wine, Culture and Travel: Heavenly Nights in Old Castile: Adventures with Ambrosio Molinos, Maestro Cheesemaker and Subject of Michael Paterniti's "The Telling Room"
Heavenly Nights in Old Castile: Adventures with Ambrosio Molinos, Maestro Cheesemaker and Subject of Michael Paterniti's "The Telling Room"
Ambrosio Molinos with chuletillas al sarmiento, lamb chops cooked over grape vine cuttings. Photo: Gerry Dawes©20004 / gerrydawes@aol.com. A book based on Ambrosio Molinos, The Telling Room: A Tale of Love, Betrayal, Revenge, and the World's Greatest Piece of Cheese by Michael Paterniti, author of Driving Mr. Albert: A Trip Across America with Einstein's Brain, was released 30, July 2013. Mike Paterniti used a few paragraphs from this article in The Telling Room, among them my description in Ambrosio telling how to make “rotten pot” stew. Paterniti, whom I met in Spain, told me recently that he has read this piece half a dozen times. Unlike many Spanish cities and coastal resort areas, which have lost much of their unique Spanish flavor to modern developers, the back country towns of the Duero River valley and the upland region of Burgos province known as the Cradle of Castile still smack of old Spain, the Castilian Spain of evocative landscapes, ancient castles, old monasteries, and brick baker’s ovens redolent of lambs roasting. For a period of almost ten years, when I was exploring the Ribera del Duero to write about its then unique local wines, a few of which could hold their own with the world's finest, I came to know the area as well as any place in Spain. Early on during my travels in the Ribera del Duero, I met Ambrosio Molinos, an aficionado of great regional food, a gourmand of repute, and one of the greatest artisan cheese makers of Castile. He, his wife Asunción, and their three children lived Gúzman, an isolated village high up on the páramo, where most of Paterniti's The Telling Room is set and then in Roa de Duero, a village with a rocky history, which stands on a high cliff overlooking the Duero River. 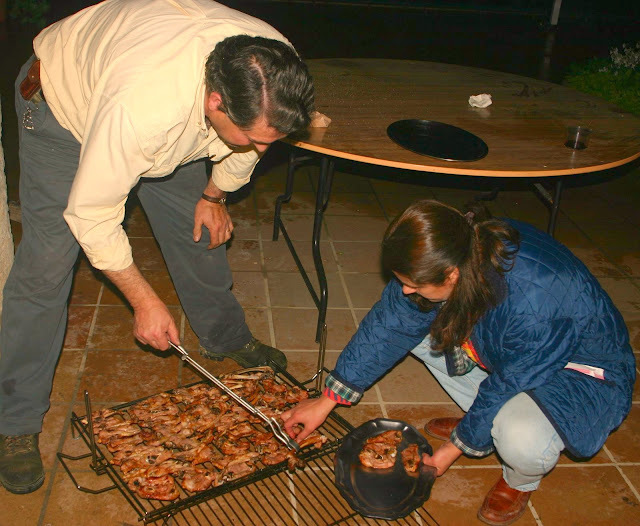 Ambrosio Molinos and his wife, Asunción, with chuletillas al sarmiento, lamb chops cooked over grape vine cuttings, Gúzman (Burgos province). Photo: Gerry Dawes©2004 / gerrydawes@aol.com. It was the Pérez Pascuas brothers, the exceptional wine making family of the nearby village of Pedrosa, who introduced me to the stout, jovial Ambrosio, who came over to Pedrosa to eat wild boar with us and brought his guitar and one of his wonderful Páramo de Gúzman Burgos cheeses with him. Ambrosio has a quick and easy laugh, an incredible sense of humor, and always seemed to be in good spirits. We soon become fast friends because of a common interest in wine, regional cuisine, and our penchant for scandalous jokes. He began to join me on my explorations of the Ribera del Duero, sometimes driving me in his Land Rover, sometimes guiding me, often following, as I introduced him to things and people in his home region that even he didn’t know. Except for my propensity to gain weight when I spent time in the company of him and his robust appetite, I suppose I could travel with him for weeks on end, for I have know few more amiable companions. Ribera del Duero. At a lunch that I arranged for a Commonwealth Club of California tour at Pérez Pascuas winery in Pedrosa de Duero. 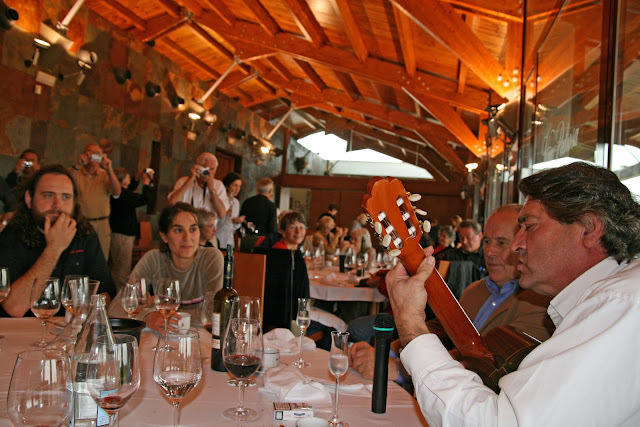 Ambrosio Molinos entertains with his guitar and his voice. No one wanted to leave. It was a magical afternoon. Ambrosio's gorgeous daughter, Asun, is seated at the table. Ambrosio loves to eat as much as anyone I have ever met. He relishes the intellectual aspects of gastronomy as well and can talk for hours about the art of eating, then on occasion after dinner, can spend another hilarious hour on the scatological joys of eliminating what he eats. He is a hefty man. One hot summer day, when I stopped by his home in Roa on a surprise visit when I was following the bullfighter Fran Rivera around Spain with a New York-based writer, I encountered Ambrosio shirtless, having a casual lunch with his family. When I kidded him about putting on weight, he clutched a roll of fat at his midsection, and told me, "That’s not me, that’s my shirt." Ambrosio Molinos in Roa de Duero. On several occasions, Ambrosio Molinos had told me about the Colegiata of Covarrubias and its famous polychrome wood triptych of the Epiphany, but on previous trips, it had been closed when I arrived, so this June day, I made arrangements to meet Ambrosio for lunch at a new Covarrubias restaurant, De Galo, and visit the Colegiata after lunch. It was to be another memorable day in Castile. I arrived at a small parking area just outside the 16th-century gate that is the northern entrance to town just as Ambrosio was arriving in his Land Rover. As usual, we were both hungry, so lunch was the first order of business. It was three p.m., a civilized hour for two old friends and aficionados of good food to begin a serious lunch. However, on past trips, I had had little luck with the food in Covarrubias. I had distinctly bad memories from my first encounter years ago at the Parador de Arlanza across the Plaza Doña Urraca and the other restaurant on the square, Galín, was known for its middling comida casera ("home cooked" food), including olla podrida, literally, rotten pot stew, an undeservedly famous Castilian dish that Ambrosio had introduced me to a couple of years earlier. One day over lunch at Julián de Tolosa, a trencherman’s Basque restaurant in Madrid, Ambrosio carefully related the recipe for a great rotten pot stew into my tape recorder, thus preserving for posterity the secret Castilian formula for mainlining pork: "First, an olla podrida should be made with alubias de Ibeas, the little black-red beans that come from around the village of Ibeas east of Burgos and are the best beans in Spain. That is most important. Then, in a clay stove top casserole, you slowly cook the beans with a special adobado (marinaded) pig foot, a marinaded pig’s ear, and pork ribs. The adobo marinade is made with salted water, to which orégano is added or, depending on the area, other spices such as black pepper, bay leaves, and paprika, sometimes even piquant paprika. The marinade, which gives the olla podrida its strong flavor, also preserves the meat, so it can be left all season in a cool place such as a basement or a cave. Then you put in some fatty chorizo, the one they call botageo, because it has a higher percentage of fat to lean, and some morcilla, blood sausage." But, there is more. Ambrosio continued, " Once the olla podrida is cooked, you make what we call bolas, made from toasted hard bread that is then mixed some of the pork fat from the stew to make "balls," which are then fried and served on a platter alongside the olla podrida. The meat that was cooked with the beans is served on a separate platter, the beans are also served on a separate dish, and guindillas, pickled onions and other pickled vegetables are served as a garnish. Then all you need is a big appetite." He then recommended a scandalous precaution, not to be repeated here, for the flatulence he said was sure to ensue from eating rotten pot stew. I had gone with Ambrosio to one of these olla podrida pig-outs near Ibeas and he also had offered to take me to mother of all pig festivals at the Virrey Palafox restaurant in El Burgo de Osma in the neighboring province of Soria, where they have multi-course pig meals in February to celebrate the winter hog slaughter. But now, my concern was for Restaurante De Galo, whose chef-owner was the son of the owners of Galín, who were proud of their olla podrida. Just thinking about rotten pot stew conjured up visions of thousands of tiny porkers lumbering through my arteries in pursuit of the Pig Olympics gold medal for cardiac arrest. Fortunately, De Galo turned out to be one of those great culinary surprises that can not only make your day, they can make your week and provoke future gastronomic pilgrimages. The restaurant was just inside the main village gateway, so we went straight in. Not only were we to have a great meal, I was introduced to another of the mysteries of Castile, one as basic to the human condition as food itself, but unique to this region and utterly fascinating. Inside the restaurant, in an ante room, was a cocina serrana, a "kitchen of the sierra," specifically the Sierra de la Demanda. Chimenea serrana, Restaurante De Galo. Covarrubias (Burgos). Galo, Restaurante De Galo. Covarrubias (Burgos). Our meal was as memorable as the cocina serrana. This man Galo could cook. We began by splitting a whole besugo escabechado, a sea bream marinated in an escabeche sauce and served cold. We mopped up the sauce with good coarse Castilian bread. Then came a local specialty that I seldom pass up when I see it on a Burgos-area menu, those alubias rojas de Ibeas that Ambrosio talked about. These were cooked with chorizo, served with grilled morcilla, and guindillas, the slender yellow-green piquant peppers that are a Basque specialty without which one, especially this one, does not consume his beans. The main course was vine-grilled baby lamb chops (served here with the kidneys), roasted potatoes, and what in recent years has become an indispensable side dish with roasted or grilled meats, delicious pimientos de piquillo, the sometimes slightly spicy little red peppers that are one of the great delicacies of Spain. We washed this repast down with a delicious, inexpensive Covarrubias wine from Ribera de Arlanza, a growing region that was on the verge of disappearing just a few years ago. Similar to a Ribera del Duero wine, but lighter and fresher, this Vi a Valdable, was not only perfect with the food, it cost less than the equivalent of $7. A café con leche, a delicious limited production Baines Pacharán from Navarra, and a Montecristo cigar were dessert, after which we would waddle off in the direction of the Colegiata. Serving alubias (beans) at Restaurante De Galo. Covarrubias (Burgos). Over the years, Ambrosio and I developed a running gastronomic joke. First, in the morning, we claim to just about anyone who will listen, we have some breakfast, at which we discuss where to make our first stop for tapas, where we plot where to stop for the merienda (a kind of in-between-meals snack). After the merienda, it goes without saying that we need another tapa before lunch. After lunch, another tapas opportunity is in order, so we can discuss where we are going for the afternoon merienda, pre-dinner tapas, and then dinner, nothing too heavy, of course. Then there is the tough decision about where to have after-dinner drinks and cigars (I have since quit smoking cigars), so we could plot where we were going to have breakfast the next day. It is mid summer and I am with Ambrosio and his family on a path half way up the hill that rises above Ambrosio’s hometown of Guzmán, a small village located at the western edge of Burgos province just a few kilometers from Roa in what used to be known as Old Castile. At ten in the evening, the sun has just gone down over the páramo, the great stark Castilian plateau, which so captivated the imaginations of such writers as Antonio Machado and Miguel Delibes. The páramo, like the large herds of sheep which graze these ancient hills, has recently been shorn of its cover. Gone are the infinite rows of ripening wheat that wave seductively over these hills earlier in the summer; now the fields are uniformly close-cropped and lay in the soft evening light looking like large tawny lions. From here, I can see a vast section of the great wine-growing Duero river valley and, in the distance, more hills where the last rays of the sun bathe the occasional hill top village with a rich golden light. The hill behind me is honeycombed with family-owned wine and cheese caves, cool manmade caverns which were already centuries-old when Columbus discovered America. In a little stone shed built into the hill, Ambrosio and Asunción, are laying out the fixings for a simple, but first-rate and unforgettable dinner: a salad of garden-picked lettuce, perfectly ripened flavorful tomatoes, and sweet Spanish onions; wedges of Ambrosio’s superb Burgos sheep’s milk queso Castellano, a delicious, slightly sharp, white cheese; round, thin slices of home-cured country chorizo; chuletillas (milk-fed lamb chops), and red cherries picked from a villager’s trees. 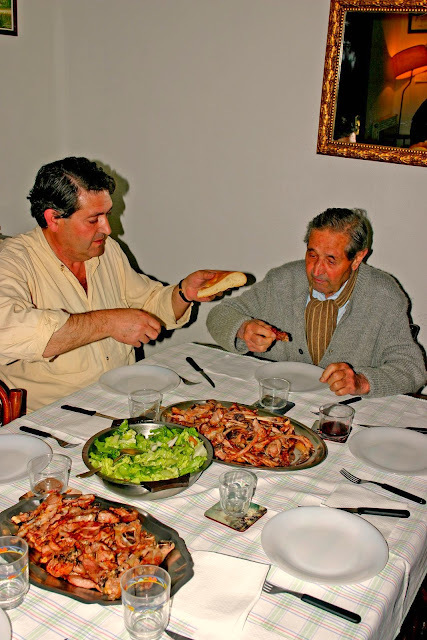 The meal will be accompanied by the rustic, but delicious, country wine which Ambrosio and his father buy from the cooperative in the neighboring village of Quintanamanvirgo, then age in large old barrels down in the cave next door. Ambrosio ages cheeses in his cave. Soon we descend into the pitch dark depths of the wine cave, lighting our way by candles. The bodega, as a wine cellar is called in Spain, is perfectly cool and properly humid for ageing wine. It is rustic, old, full of atmosphere. There are cobwebs, mold, 16-liter bulbous glass garrafas with cork stoppers, a modest stash of bottled wines, a couple of smaller barrels, and a large cuba barrel, where last year’s harvest of wine is gaining character. Using a siphon, Ambrosio draws a good measure of dark red Ribera del Duero wine into a porrón, a beaker-like pitcher with a neck for putting wine in and with a long needle-nosed spout. The spout facilitates sanitary communal drinking for those who have mastered its use and wine-stained shirts or blouses and good-natured expletives from those who haven’t. Part of the ritual demands that we sample the wine from porrón down in the cave. Ambrosio lifts the beaker by its glass neck and places the tip of the spout just inside his open mouth without letting it touch his lips or tongue. He elevates the bottom of the beaker and a thin stream of wine flows out. Once the flow begins, Ambrosio gradually extends the porrón to arm’s length taking the wine into his mouth in an arching stream that flashes ruby in the flickering candle light. Watching someone drink from a porrón in one of these wine caves is spectacular, beautiful, folkloric. There is almost a religious quality to this rite, a discernible atavistic pull that binds those who share from this vessel. This wine bonding, camaraderie in a jug, is the stuff of vintage nostalgia. After a couple of more rounds, we draw more wine to top up the porrón and climb the hand-hewn steps out of the cave into the fresh evening air. Around us, other villagers are also preparing al fresco dinners in their own hillside merenderos, as they call these little huts, few of which are anything more than a cave anteroom with a stone table in front. One of Ambrosio’s friends from the village has brought up a bundle of grape vine cuttings, which he sets alight on the ground in front of a rough masonry retainer wall. A blaze roars several feet above the bundle. I photograph this culinary pyre with the tower of the village’s 16th-century church, the rust-red, tejas-tiled roofs, and the lovely pastel vestiges of the glorious sunset as a backdrop. 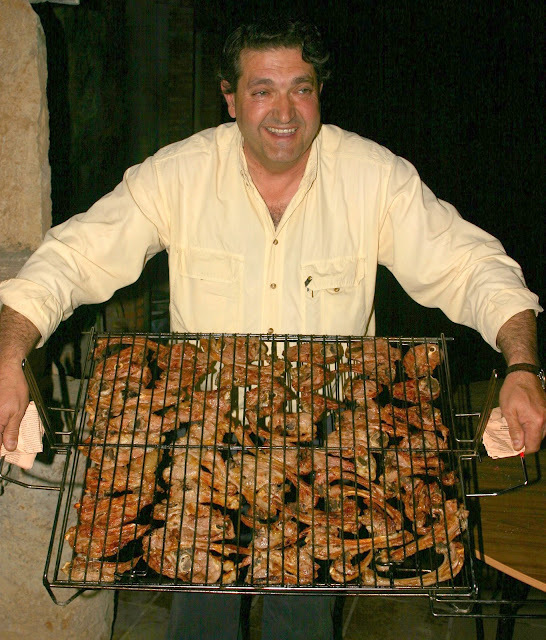 While the flame is blazing itself out, leaving only squiggly, glowing vine embers that are perhaps the perfect fire for cooking chuletillas, Ambrosio loads a hinged grill with two dozen little lamb chops. The grill has handles so that the whole device can be flipped over to finish cooking the other side. While the chuletillas are roasting, we pass around the porrón and Ambrosio starts telling us about his 70 year-old father’s wine drinking habits. Ambrosio claims, that his father--the late Ambrosio padre--in his youth, drank three to four liters of wine per day. Some field workers drank six, he says. He calculates that his father has drunk some 85,000 liters of wine in his life. "Tres camiones cisternas--three tank trucks full," he figures. with chuletillas al sarmiento, lamb chops cooked over grape vine cuttings. Photo: Gerry Dawes©2004 / gerrydawes@aol.com. "His front tooth has a groove in it - - like limestone which water has dripped on for years - - where the stream of wine from the porrón hits it. When he had a stomach operation last year, the doctor told him he could only have one glass of wine per day, so he bought a very large glass. He refuses to drink water in months which have ‘r’ in them, so he still drinks a liter of wine a day." Ambrosio’s hilarious account of his father’s love of wine is just the beginning. The smell of the fire-roasted lamb is irresistible and the cool wine flows freely, calling for another descent or two into the cave. We eat, drink, laugh, and talk until midnight. Out here in the Castilian countryside, the sky is a celestial canopy blazing with thousands of bright stars that seem to be hovering just above our heads. Finally, the cool air coaxes us down to the village bar for a café con leche and a brandy. These are heavenly nights on the páramo of Castile.